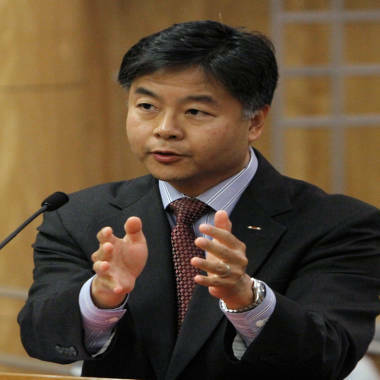 California state Sen. Ted Lieu says therapy that seeks to change a child's sexual orientation amounts to psychological abuse. California has moved one step closer to becoming the first state in the nation to ban “gay cure” therapy for teens. The Democratic-controlled state Assembly on Tuesday voted 52-22 to approve a bill that would prohibit licensed therapists from providing so-called “sexual orientation change efforts” to children under 18. The bill now goes to the Senate, which approved an earlier version in May, for concurrence on amendments. The Senate must act no later than midnight Friday for the bill to be sent to Gov. Jerry Brown’s desk. Brown, a Democrat, has not indicated whether he will sign the measure. The bill’s sponsor, Sen. Ted Lieu, D-Torrance, says treatments that attempt to change a gay kid into a straight kid are harmful and amount to "psychological abuse of children." “These non-scientific efforts have led in some cases to patients later committing suicide, as well as severe mental and physical anguish,” Lieu said in a press release hailing the vote. "And some of those are sissy boys,” Lara said, Reuters reported. “And some of those sissy boys grow up to be Assembly members. And some of those sissy boys need help. And we are here to stand with those sissy boys." Opponents said during debate that the bill intrudes on the rights of parents to make choices for their children’s care. "That's why parents have children -- to hand down their legacies, their belief systems, the way they want their children raised," Assembly member Shannon Grove, R-Bakersfield, was quoted by Reuters as saying.